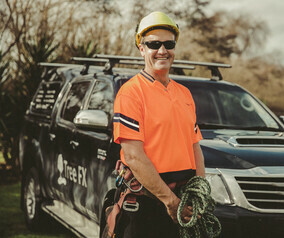 Expert workmanship from fully trained and certified Arborists servicing the Waikato. TreeFX offers a full range of arboricultural services, using correct and current industry standards and practices. We work in Hamilton, Cambridge, Te Awamutu, Tamahere, Waikato wide and provide free quotes. We pride ourselves on providing professional, safe and cost effective tree care. We're committed to outstanding customer service, ensuring all sites are left tidy, and all tree work is completed to the highest standard. Our service is friendly, respectful and personalized.